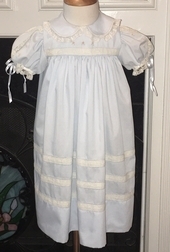 We just love our new heirloom dress Anne for Easter, flower girls, portraits, holidays and other special occasions. 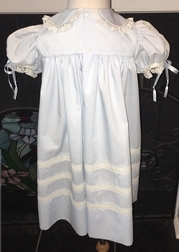 We start with a flowing batiste short sleeve style dress and add a pretty Peter Pan collar. 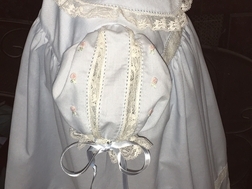 The bodice and skirt of the dress are separated by French lace. 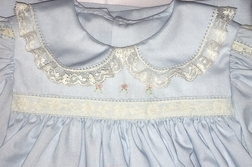 The collar, sleeves and skirt of the dress are also embellished with French lace. The middle of the sleeves are made with a gorgeous feature: French lace inserts! The dress is completed with lovely hand embroidered floral bullions.